It was in the year 1872 in Kodaikanal that a Lieutenant Colonel Coaker, of the Royal Engineers division of the British Army, built a path on the slopes of Mt. Nebo overlooking the beautiful Green Valley. In his honour, the path is named Coaker’s Walk and the Walk tops the list of Kodaikanal’s tourist places. The walk is about a kilometer long and two above sea level, and runs along the curved edge of the steep slope on the southern side of Kodai Road. 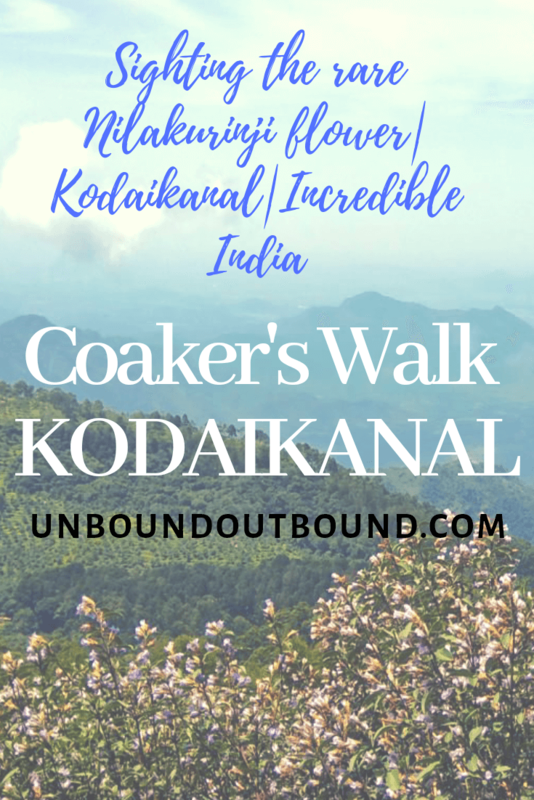 Along Coaker’s Walk, soak in the tranquility of lush green forests, misty mountains, scenic valleys and pretty flower trails which offer views of the Kurinji flower, a rare flower that blossoms once in twelve years. The Kurinji is a perfect example of the phrase ‘Calm before the storm’; when it blooms, it floods the valley with its violet shade. Entire valleys can be found draped in violet in blooming season. The Kurinji last flowered in 2006 and 2018 is the year to see it in bloom once again. Miss this chance and you would have to wait till 2030. On a cloudless, clear day there are interesting sights to witness: Dolphin’s Nose in south, Pambar river valley in south-east, birds eye view of Periyakulam and even the city of Madurai. Through the telescopes placed at the Telescope House, one can have a sneak peak at the daily lives of the villagers who have made the valley their home. 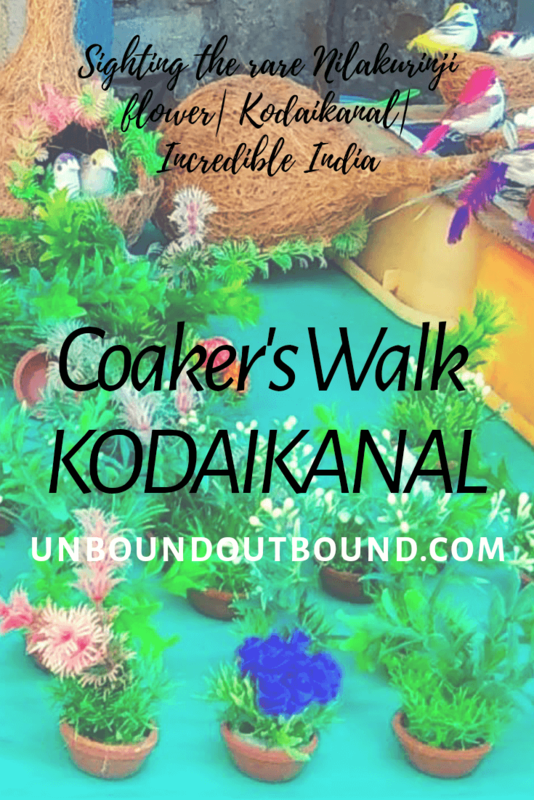 We reached Kodaikanal in the morning and the first thing we set out to do was the Coaker’s Walk. We ate our breakfast of ‘Coriander Rice’ packed from home as we strolled along, enjoying the scenic beauty and sipping the steaming hot ‘Masala Chai’ from the stalls on the walk. These stalls sell mouth-watering paani puri, tastiest of groundnut bhels and other street munchies. At the end of the walk, just outside the exit gate, there are shops selling varieties of homemade chocolates and essential oils. We cannot comment on the authenticity of these oils, however what we do know is that we had our stomachs full of these chocolates and bought many for the go. Coaker’s Walk is truly a gem of a place where the unique phenomenon of ‘Brachem Spectre’ can be experienced. This occurs when the sun is on your back and the clouds are in the front, such that the sun casts a shadow on the clouds with a rainbow halo around the head in the shadow. And of course, good things don’t come easy, so does this phenomenon, which is quite rare and can be witnessed only if you are lucky enough to visit when the weather conditions are suitable. Coaker’s Walk starts near Van Allen Hospital and winds to join the main road above St. Peter’s Church, offering spectacular views of the lush green hills beneath. It can be reached by both private and public transport via Saint Mary’s Road. However, do bear in mind that there is limited parking area and you might need to park your vehicle somewhere far off. If you are searching for info on how to reach Kodaiakanal, the best option is one of the many buses that ply along this route, they start from all the major cities of Tamil Nadu. You could reach Madurai by air and head over to Kodaikanal by a taxi. Coaker’s Walk is just a ten-minute walk from Kodaikanal Bus Stand and we recommend staying somewhere nearby. Hotel Astoria is a great budget hotel to stay at while Hamuse is for those seeking a luxury accommodation. We recommend choosing one of these so you can reach Coaker’s Walk easily and also visit other places nearby. It also helps that the bus stand is a stone’s throw away from both these hotels, so you can utilise your time travelling to places. The shops at the end of Coaker’s Walk are decent and can provide you with basic necessities such as food and water, if you have forgotten to pack them before your trek here. Coaker’s Walk provides a variety of yummy snacks along its length and you can always enjoy something steaming hot while taking in cool breeze and the amazing views. TIP: We recommend buying Homemade Chocolates from this shop of a young woman just outside the exit gate near St. Peter’s Church. The prices here were lower than what we found in all the other shops in the markets near the bus stand and Kodai Lake. And we found the taste simply out of the world. It is recommended to do the walk before 2 pm as mist settles in afterwards, concealing the views of the valley. Our recommendation? Anytime around sunrise would present a perfect picture op of the sunrise in the mountains. Tip: Do not opt for a sunset viewing as no matter the season, crowds throng Coaker’s Walk. Kodaikanal experiences pleasant weather throughout the year with temperatures ranging from 12 deg to 20 deg in summer months of April to September and 8 to 18 during the winter months from October to March. Anytime is a good time to visit here. Monsoon rains are from June to August which makes it a little off-season here but nonetheless beautiful. We personally feel July would be the best time as you would not have to face crowds and prices for all the things are lower. May and June months tend to get extremely touristy as schools in India close down during this period and families flock up here to enjoy summer vacations for their children. Evenings are cool and nights are cooler. We recommend carrying a pullover after sunset. There are a plethora of attractions that you can merely walk to, within a two-kilometre range. The first of them is the iconic Kodaikanal lake, a 150-year old man-made lake that put Kodaikanal on the map. The lake certainly is the happening place in Kodaikanal. You could take a leisure stroll along the lake, admiring its beauty and breathing in the fresh air or you could choose to have a closer look by going boating in the lake. The La Saleth Church is another attraction that people visit before heading off to the Vattakanal Falls. The Vattakanal falls is the place to go to if you are looking for a trek amidst nature. The falls is a three-stage falls with the number of visitors decreasing with each lower level. Trekking down to the last level is a great couple activity. Nice to see another side of India!